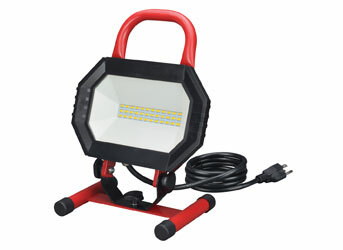 Energetic Lighting’s LED portable worklight provides an energy efficient alternative to traditional high-wattage halogen worklights. Operating at only 15 watts, while outputting plenty of light, the worklight housing stays cool to the touch. With LED as the light source, the housing profile reduces down to a slim and compact shape making this worklight easy for storage and setting up in tight spots. With a durable die-cast aluminum construction and an LED lifetime rating of at least 25,000 hours, this heavy-duty worklight is designed for many years of reliable operation.